Last year Burger King made $117,000,000 in profits. Walgreens made $253,000,000. 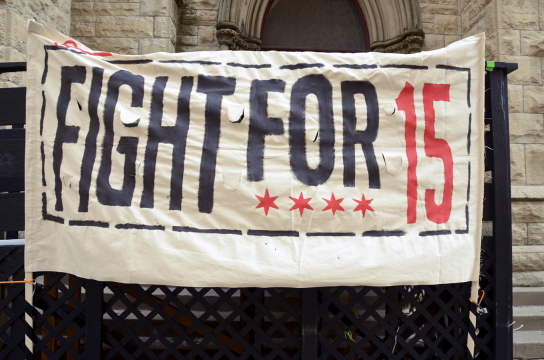 Hundreds of fast food workers in NYC & Chicago recently participated in a strike to demand $15/hr. It is time to bring the Fight for Fifteen campaign to Oakland. We will gather at Oscar Grant Plaza at 14th St. & Broadway for a rally on Wed, May 1st at 5 PM for a rally followed by a noise demo march throughout downtown Oakland at 6 PM. There will be food at the rally and also after the march back at the Plaza. With the cost of rent driven up by gentrification, plus childcare, healthcare and other bills, $8/hour is not enough to survive in Oakland. Mayor Jean Quan says Oakland is “rising” but the lowest paid workers, who are more likely to be people of color and women, are left behind. $15/hr livable wage for all Oakland workers! Expose the practices of corporations who thrive off of low wage labor. And, as we all know, whatever they do in back east, we can do better in Oakland. and follow @SfcommuneSF for information about the anti-capitalist march, building occupations, and midnight noise demo in the Bay Area! Eastside Arts Alliance, 2277 International Blvd. 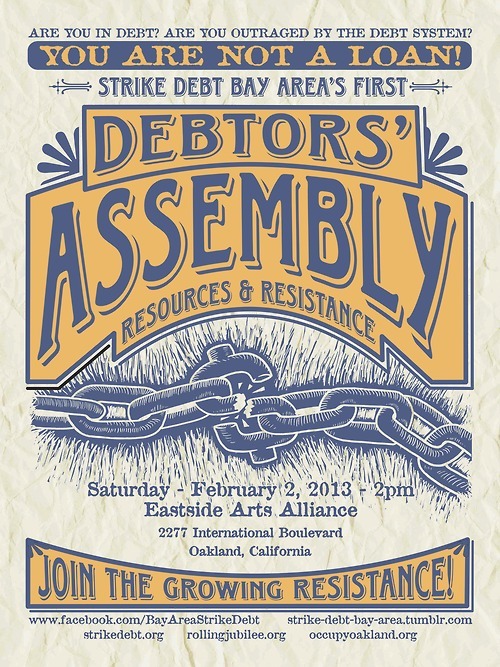 On Saturday, February 2nd, Strike Debt Bay Area will host Oakland’s first Debtors’ Assembly. Debt keeps us isolated, ashamed, and afraid—of becoming homeless, of going hungry, of being crippled or killed by treatable illness, or of being trapped in poverty-level jobs. Those facing foreclosure, medical debt, student debt, or credit card debt feel alone, hounded by debt collectors, and forced into unrewarding work to keep up with payments. ORGANIZATION INFO: Strike Debt Bay Area is the local chapter of Strike Debt, an international movement of groups working to build popular resistance to all forms of unjust debt. 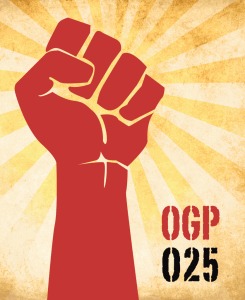 Strike Debt has organized the Rolling Jubilee, the Debt Resistors Operations Manual, and local debtors’ assemblies. Strike Debt supports the creation of just and sustainable economies, based on mutual aid, common goods, and public affluence. We owe the financial institutions nothing. It is to our friends, families and community that we owe everything. Oakland Obama Office Occupied in Support of Pfc. Manning. Video. I was there. When it came down to it we decided that I would not be arrested. One of the reasons for that was so I could upload and distribute this video I took within minutes of us entering. This is before the march and media made it up here. In the video you will see Obama's staffers push us when we tried to move chairs so we could sit in the middle of the office. I got pushed which made me drop my phone and then a man brandished a chair against me. 8/17, 11:30am: Livestream replaced with video clip recorded last night. Six of the seven people, including veterans, were arrested during the nonviolent sit-in. The office was shut down for the night. 11pm Eastern: Scott Olsen and members of Iraq Veterans Against War are currently sitting in an Obama Campaign Headquarters in Oakland demanding Pfc. Manning's release. Dozens of supprters are also rallying outside; some police are on the scene. Open the doors, reclaim the commons. This was an abandoned library, now its a reclaimed one. Despite this vision, the building was one of seven branch casualties of budget cuts in the late seventies, severing vital library life-lines in poor and working communities. From the early 70s untill the late 80s, this building was a school created during the Chicano Movement called the Emiliano Zapata Street academy. Since then, the “Latin American Branch” library building located at the corner of Miller and 15th st. has mostly sat empty, despite the fact that the next nearest library is miles away, and increasingly difficult to access in a city like Oakland with an increasingly expensive transit system. With its eroding chain link fence and decaying, armored exterior, the building is much more than an eyesore; the unused, but inaccessible, space creates a life-draining dark vacuum of stability that serves at best as a convenient place for the unscrupulous to dump their old mattresses, couches and assorted garbage. Update, 8/14: Late last night, dozens of Oakland police arrived on scene, confiscated donated books, looked the gates with zip-ties, and boarded up the building to make sure it remains a blighted, decaying building. Thanks for keeping the neighborhood safe, OPD! Community members are meeting to discuss future plans. *Update, 8/15: The Library lives on, now on the sidewalk! Though the inside remains closed, the space continues to be a much-needed community center outdoors. They have requested donations of books, especially children's books which are very popular with the neighbors. There is also a community garden and supplies would be helpful. Hooray community building! Follow them on Twitter for the latest events and ways to get involved at the Library.